Looking for Rest, Peace and Quiet, Romance? 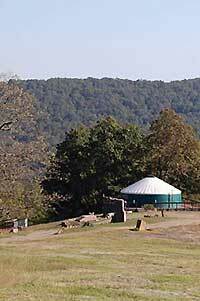 Rest, Renew, Restore, Reconnect in one of our peaceful Yurt Cabins, unique among cabins in Arkansas. 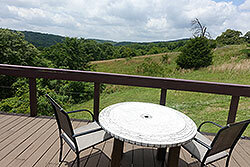 StoneWind Retreat's elegant Yurt Cabins with hot tubs on every deck, stunning views, and luxurious amenities are the perfect choice for a romantic getaway, quiet vacation, the ideal honeymoon, a surprise anniversary gift, or the weekend getaway for much needed "down-time" from the stressors of life. 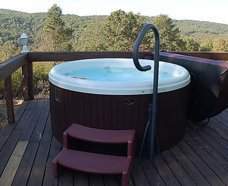 Located between Fayetteville and Fort Smith adjancent to the Ozark National Forest in the Ozark Mountains, our convenient location, panoramic scenery, easy access to nature, and elegant yurt cabins provide all you have been wanting for that "special" getaway. And if you are a Razorback fan, we are a short drive from Baum Stadium for fun-filled Razorback weekends. Never been in a Yurt, never even heard of one? You are in for a wonderful surprise! Absolutely unique among the cabins in Arkansas, our eight beautifully designed and elegantly furnished yurts, are designed primarily for couples (three people in some) and are available in four configurations to meet your needs: The Sanctuary Suite, the Sunset Vista Suite, four Vista Yurt Cabins, and two Deluxe Yurt Cabins. Each of our spacious and elegantly appointed Yurt cabins is built on its own 40'x40' deck overlooking the forests and mountains, with its own 4 - 7 person hot tub on the deck with individual privacy screening. 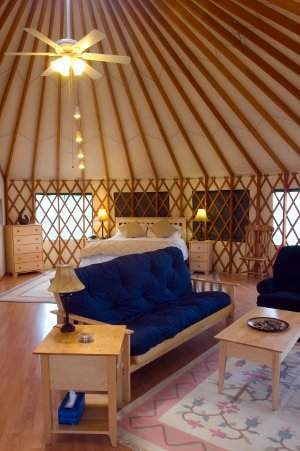 The yurts each have 709sf of living space, central heat and air, log-flame gas stoves, fully furnished kitchens, two-person showers, luxurious linens and furnishings, gas grills off each deck, and all the comforts of home, plus deck tables and chairs to enjoy the views of nature. Still curious about a "yurt?" Here's more on where they come from. Make the most of our mountain's magic with an "in cabin" full body massage from one of our licensed Massage Therapists. An hour of massage will leave you relaxed but energized and ready to enjoy your vacation. Our Massage Therapists can provide either couple's massages, or you can have an individual massage right in your own cabin. A full body massage is a wonderful way to begin your stay — and to end it. StoneWind Retreat is a great place to unwind and rest from the stress of your life, but it is also a place to learn stress-relief skills in effective formats that you can take home and use every day. Enjoy one or both of our 3-hr courses in Meditation or Qigong designed specifically for Retreat Guests in conjunction with StoneWind Institute for Mind Body Medicine. If you are ready for a simple, quick elopement ceremony, StoneWind has everything to help you get married: a minister on-site for your convenience, options for indoor and outdoor ceremonies, the private elegance of the Sanctuary Suite or one of our Vista Cabins for your honeymoon. Our on-staff minister performs wedding ceremonies in your cabin, on your deck, or in one of our unique stone gardens. NW Arkansas is a favorite destination for visitors from the five state area and across the US because here there is something for everyone — and StoneWind is within easy driving distance of it all. 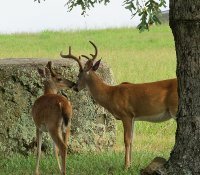 If you like the outdoors, you will enjoy our 1¼ mile walking trail with our amazing stone gardens set against panoramic mountain views, or take a short 10 minute drive to Lake Fort Smith State Park where you can fish, boat, swim, and hike on a beautiful lake. But for incredible views, overlooks, and miles of hiking trails, nothing compares to Devil's Den State Park, 20 minutes north of StoneWind off I-49 (old I-540). 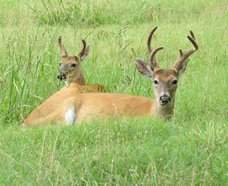 For those who prefer a wider range of activities, or when you are ready for a change, Fayetteville, thirty minutes north on I-49, and Fort Smith, 45 minutes south, have fine dining, historic museums, art galleries, antique stores, and a range of plays and music presentations.